Super-stretchable yarn is made of graphene | A simple, scalable method of making strong, stretchable graphene oxide fibers that are easily scrolled into yarns and have strengths approaching that of Kevlar is possible, according to Penn State and Shinshu University, Japan, researchers. 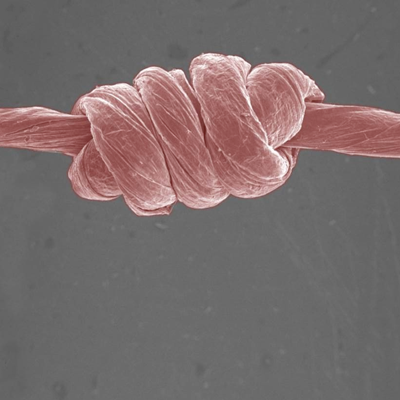 A simple, scalable method of making strong, stretchable graphene oxide fibers that are easily scrolled into yarns and have strengths approaching that of Kevlar is possible, according to Penn State and Shinshu University, Japan, researchers. "We found this graphene oxide fiber was very strong, much better than other carbon fibers," said Mauricio Terrones, professor of physics, chemistry and materials science and engineering, Penn State. "We believe that pockets of air inside the fiber keep it from being brittle." This method opens up multiple possibilities for useful products, according to Terrones and colleagues. For instance, removing oxygen from the graphene oxide fiber results in a fiber with high electrical conductivity. Adding silver nanorods to the graphene film would increase the conductivity to the same as copper, which could make it a much lighter weight replacement for copper transmission lines. The researchers believe that the material lends itself to many kinds of highly sensitive sensors. The researchers made a thin film of graphene oxide by chemically exfoliating graphite into graphene flakes, which were then mixed with water and concentrated by centrifugation into a thick slurry. The slurry was then spread by bar coating -- something like a squeegee -- across a large plate. When the slurry dries, it becomes a large-area transparent film that can be carefully lifted off without tearing. The film is then cut into narrow strips and wound on itself with an automatic fiber scroller, resulting in a fiber that can be knotted and stretched without fracturing. The researchers reported their results in a recent issue of ACSNano. "The importance is that we can do almost any material, and that could open up many avenues -- it's a lightweight material with multifunctional properties," said Terrones. And the main ingredient, graphite, is mined and sold by the ton." Penn State and Shinshu University have applied for a joint patent on the process.